LONDON • By the time the English Premier League game ended yesterday, Manchester City goalkeeper Ederson had reappeared from the X-ray suite at the nearby clinic where he had been taken to check if his cheekbone and jaw were still in working order. He had been caught flush in the face, head-high, by Liverpool forward Sadio Mane's flying studs and the red card that was shown does at least offer Liverpool some kind of excuse for the 5-0 scoreline. That incident shortly before half-time was the turning point of the match, and even City manager Pep Guardiola admitted that the result would have been different had Liverpool not gone down to 10 men. "It was one game at 11 v 11, it was equal, we both had chances. Liverpool are so quick and fast," the Spaniard said. "After 10 v 11, it was a little bit easier for us and we played the second half the way we wanted to. They didn't do well. The game was open until the sending-off. "The doctor says there is nothing broken with Ederson." Liverpool's response to the red card did not exactly offer great encouragement about the competitive courage of this team. And not for the first time, it was difficult to imagine any possible way manager Jurgen Klopp can achieve his ambitions if his side are going to defend this generously. Liverpool crumbled far too easily and once City scent blood, they can be cruel opponents. Guardiola's team were already leading courtesy of Sergio Aguero's goal by the time the referee, Jon Moss, decided that Mane's collision with Ederson 22 metres from goal constituted dangerous play eight minutes before half-time. Moss gave a straight red card and the Brazilian received eight minutes of treatment before medical staff carried him off the field and straight to City's medical facility for checks. Gabriel Jesus headed in a second in the fifth minute of added-on time and when he made it 3-0 eight minutes into the second half, it was almost a surprise City restricted themselves to only two more. Leroy Sane, one of their second-half substitutes, scored both and Ederson was back in the stadium to see the final one - the game's outstanding moment - fly into the top corner. This was certainly not the way Alex Oxlade-Chamberlain, another second-half substitute, must have envisaged his Liverpool debut going and the punishment for Mane will be considerable. He will miss their next three league fixtures- Burnley, Leicester and Newcastle - and it will be over a month before he can return, at home to the Manchester United on Oct 14. Liverpool could possibly appeal but it is unlikely to make any difference. As red cards go, however, this one will always polarise opinion. Mane's sympathisers will argue that he was entitled to go for the ball and that it was accidental. Equally, his studs were way off the ground, if the argument is whether it constituted dangerous play. Guardiola was unsure whether it was worthy of a sending-off. "He (Mane) was looking at the ball but the impact was huge. I don't know if it was a red card," he said. City forward Kevin de Bruyne, who was the Man of the Match with two assists and three chances created, claimed Mane was slightly unfortunate to see red. "It's not a bad foul, but with the way Eddy comes out of it, it's normal for a red card," the Belgian said. The last 30 minutes was an exercise in damage limitation for Liverpool. But ultimately, there was no evidence that they knew how to keep it tight and make sure the rout did not get out of control. 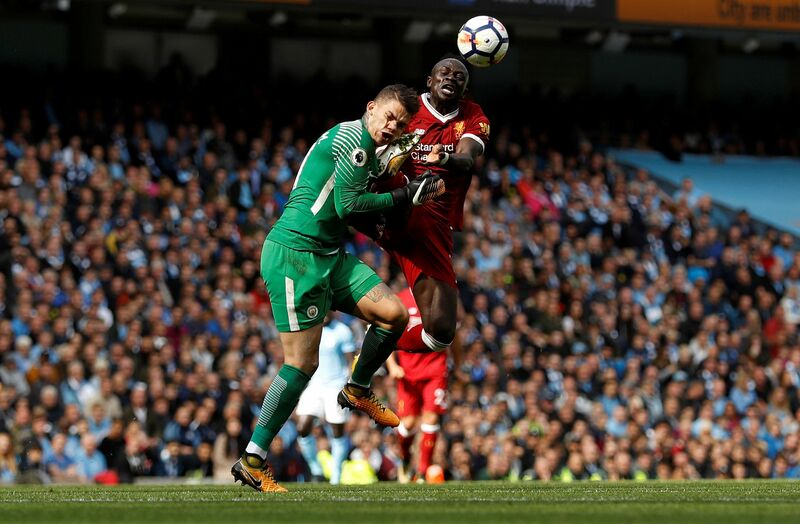 Manchester City goalie Ederson Moraes is fouled by Liverpool forward Sadio Mane, resulting in both players leaving the pitch - Ederson on a stretcher and Mane given his marching orders. The 37th-minute incident proved pivotal, with Liverpool, who had been trailing 0-1, going on to lose 0-5, the worst result of manager Jurgen Klopp's Anfield reign. Ederson underwent tests but City's medical team found no serious injury.